Making the most of the environment or, you don’t always find what you expect. This is my last reflective post for the ‘How to Teach Online’ MOOC (or TOMOOC to its many friends). You might not know it from my abysmal level of participation but I have valued being part of this cMOOC and have learnt from it – though as I now look back on the course some of my learning has been unexpected and tangential to the expected outcomes. One very personal time management / motivation type lesson I will take away is that trying to engage with a cMOOC (and I suspect that an xMOOC might have been different in this regard) whilst navigating through potential redundancy / redeployment and starting a new job is not a great idea. Although I read other people’s blog posts, commenting on them soon gave way to writing job applications and preparing for interviews. I think we all came to realise that to get the most out of a cMOOC you need to put a lot in and on this occasion I just wasn’t able to do that – sorry. My second lesson relates again to my motivation but also to the issue of authenticity which came through strongly in the later stages of the course. I do not really think of myself as someone who ‘teaches online’ in a straightforward sense. I do create online resources from which I hope people learn, but that is not exactly the same thing (my earlier blog post on hybrid teaching discussed this). At least I took something positive from approaching an authentic learning experience in an inauthentic way – knots of inactivity but lots of reflection on the importance of real, authentic, problem-based, practice-based learning. I also took on board some important principles for teaching online, though there was no ‘great secret’ there. Good pedagogy is good pedagogy wherever it happens, but you do have to think about that context / environment and plan the teaching and learning to make the most of the environment and tools at your disposal (see image). I have encountered lots of interesting material (which I have tagged and stored for future reference) in recorded webinars, the set readings and on participants’ blogs and G+ posts. My PLN has been positively enhanced and I hope to carry on sharing with many of you via social media channels in the future (you can find all my links at about.me/anne_hole). Overall then, I have learned some valuable lessons about my learning, about teaching online and offline and about cMOOCs. Many thanks to everyone on the course team and behind the scenes and to everyone who has participated in this community of online learning. Online courses where the task IS the course – I will take another look at these later on. The biggest danger: simplification, i.e. guiding/supporting the students too much; don’t be afraid to make them think/challenge them. Think about what students can do with the product/task when it’s done – can it be published or shared somewhere, e.g. on YouTube? What is an ill-defined problem? Like a real life problem! Give students an opportunity to decide how they’re going to tackle the task. A reflective exam can be an authentic task because it forces students to review the whole course: likewise, a portfolio. Is there a polished product? Is there a showcase or forum for the product? I’m definitely going to use this grid to help me analyse tasks I’ve designed and to identify which of the 9 elements need reviewing. The largest barrie rsto using PBL & creating active learning environments? TIME; it’s more work initially; but it really engages students. Recommendations if you want to start creating an authentic activity for your online class? Closing remark : The future? “Online hybrid is the way to go” (Peter Leong). This caught my attention because this is the way I currently teach my courses: 50% F2F; 50% online. Personally, I feel it combines the best of both worlds. I used to teach only F2F classes but have never taught purely online, so I can only compare F2F with blended/hybrid. The postings on the community wall: I read most of the blog posts and responded to only to a couple. One which very succinctly summarizes why students don’t participate in online discussions was posted by Debbie. What I want to do with all the above input? Here’s a semester task I give my Master’s students in 4th semester which I intend to review using the framework to check how authentic it is. The aim of this activity is to provide you with an opportunity to use/extend the vocabulary and apply the skills you’ve acquired in the first three semesters. It is an on-going project which you will do with three other students. It is part of your participation grade. Your news broadcast should last between 10-15 mins. The features should somehow be related to knowledge management. Each person in the team should have roughly the same speaking time. Roles for your team can be: anchorman/anchorwoman, roving reporter with eye-witness live reports, foreign correspondent etc. Give your news station a name and have a poster with your logo behind your news desk. Create a jingle for your news broadcast – if possible, produced by the group. Have lots of short but snappy features. If contributions are too long, it can get boring. Don’t forget to intersperse your news broadcast with 30-second commercial spots. Include a VIP interview either live or recorded, but keep who you have chosen as your VIP top secret from the other groups. Show evidence of the language and skills you have acquired over the past 2 years in your news broadcast (broad range of vocabulary & word partnerships, grammatical accuracy, presenting/moderating skills, and last but not least, excellent intonation and pronunciation). The viewers you have in mind for this news broadcast are people interested in knowledge management – they could also be potential KM students. At our next F2F session, your speaking activity will be an editorial meeting with your group. Start thinking about what you could include in your group’s news broadcast – make notes/add ideas to your group’s Wallwisher wall (to be created by anchorwoman/man). Editorial meeting with your group in F2F 2 to discuss your ideas and put together a plan for who’s going to work on which tasks during the next online phase. Live news broadcast in our last F2F session (June), where each group member has to participate (live and/or recorded). A video of each news broadcast will be made (souvenir!). We have with us in the studio Mr….., who has just …. Ms…… – welcome to the studio! We welcome to the studio Mr….. This is ………… reporting from …… Can you hear me? Yes, loud and clear. Go ahead! Sorry, Judy, but you are breaking up. We’ll get back to you later. And now over to …. This is ………. returning you to the studio. This was …… reporting for CNN. Our special correspondent John Smith is currently …and we’re connected with John via Skype. And now it’s time for a commercial break. So, until tomorrow, same time, same place …good evening! So, from all of us at the CNN studio, have a nice evening! One thing which definitely needs rethinking after listening to all the discussion about rubrics is assessment. Till now, if students produced a news broadcast i.e. actively participated though out the semester and were involved in the final product (live or recorded), they got full marks. I adapted an online forum task (wine marketing class) and have now incorporated some triggers for responses (thank you, Rachel!). What do you think? 1) Post a comment on the marketing forum by 4 Nov – state the article title (+link/reference), 3 things you learnt, and one thing you found particularly interesting or surprising. When posting: make sure your subject line accurately reflects the title of the article. 2) Follow up: Read some postings from classmates who read a different article to yours. Then select one (preferably one that has not yet been responded to) and reply to that person by 18 Nov. When responding, try to go beyond a “yes” or “no” or “I agree”, and really engage with the person’s comment, e.g. ask questions to clarify something you’re unsure about, suggest alternatives, extend on an idea, offer a resource link for more information. Useful starters: I was intrigued…; When you mentioned that… it made me wonder…. ; Have you thought of…; What about…? Make sure you check the platform regularly – for news/updates, forums for new postings etc. Twice a month is not enough! Check whether there’s anything in the handouts folder that you need to print out in preparation for the next F2F session a few days before your class – see handouts folder & the appropriate sub-folder for that F2F session. Otherwise, make sure you have access to these materials on your tablet/laptop in the F2F session. Online task descriptions – see them as a kind of “To Do” list – ticking things as you do them is satisfying! But careful – these descriptions will be updated & linked as the course proceeds, so make sure you’re always working from the current version linked to the course outline. Deadlines are set so that tasks are coordinated. It also means that there’s enough time for your tutor to read your postings/assignments and provide timely feedback. Pls stick to them! But if there’s a problem, get in touch with your tutor and ask for an extension. Email – only if there’s something very private you’d like to discuss with your tutor; otherwise post on the corresponding forum – then everyone will benefit from your query and the response. This is where you apply what you’re learning, where you communicate with your classmates and tutors and basically, where we all stay in touch/help each other during the online phases. The forums are monitored by your tutor, who will remain in the background unless something needs to be clarified. Your postings are a wonderful source of knowledge and are also the basis for valuable tutor feedback on language and task achievement. They are part of your participation grade. There are designated forums for the tasks you are assigned, so pls don’t make new forums; use the ones that are there, just make a new thread within those that exist. New forums will be created (by tutors) to accompany the online phases when the time comes. Post comments in the appropriate one, e.g. help forum – for any queries you have with your SDL, online tasks, language and to share/communicate with the community. Read through your class mates’ posts first and try not to duplicate theirs. Write a subject line that is a keyword summary of the content of your posting, e.g. IT/can’t upload file; KM article/where? Create lengthy texts in Word and then paste into a forum. This will alleviate any potential loss of your writing should there be an IT problem. And it means you can also spell-check/edit your text before posting. This is important because you won’t be able to edit your forum contributions after you publish. Activate hyperlinks so that readers can access the URL with one click. Connect content on the platform by inserting the Factline ID – but always enter the .0 version. When responding, try to select classmates’ postings that haven’t already been replied to – it’s motivating for everyone to get a response. When responding, try to go beyond a “yes” or “no” or “I agree”. Give advice, ask questions to clarify something you’re unsure about, suggest alternatives, extend on an idea, offer a resource link for more information, or otherwise engage with one another’s comments. Useful starters: I was intrigued…; When you mentioned that… it made me wonder…. ; Have you thought of…; What about…? Welcome to the first of a series of presentations on how to design and foster an online learning environment for student success. In this first part, I will introduce the purpose of this series, identify the importance of Fostering a Positive Learning Environment and relate this to the Community of Inquiry Model. Part 2 will feature an examination of the 7 Principles of Good Practices in Undergraduate Education and Part 3 will feature an examination of Bloom's Digital Taxonomy as it relates to establishing a positive online learning environment. If you would prefer, please review the PDF version of the presentation entitled "Fostering an Online Learning Environment for Student Success"
Chickering, A.W., and Gamson, Z.F. (1991). Applying the Seven Principles for Good Practice in Undergraduate Education. New Directions for Teaching and Learning. Number 47, Fall 1991. San Francisco: Jossey-Bass Inc.
Drouin, M. & L. R. Vartanian. (2010). Students’ feelings of and desire for sense of community in face-to-face and online courses. The Quarterly Review of Distance Education. Vol 11(3), pp. 147-149. Gravells, A (2007) Preparing to Teach in the Lifelong Learning Sector – Level 3 Coursebook. Learning Matters ISBN 1844451173. Rovai, A. P. (2007). Facilitating online discussions effectively. Internet & Higher Education, 10(1), 77-88. (ERIC Document Reproduction Service No. EJ796865) Available online at http://dx.doi.org/10.1016/j.iheduc.2006.10.001. Rovai, A. P., & Baker, J. D. (2006). Community and gender in the virtual classroom. In E. M. Trauth (Ed. ), Encyclopedia of gender and information technology (pp. 103-108). Hershey, PA: Idea Group Reference. ISBN: 978-1591408154. Rovai, A. P., & Barnum, K. T. (2003). Online course effectiveness: An analysis of student interactions and perceptions of learning. Journal of Distance Education/Revue de l'Éducation à Distance, 18(1), 57-73. Shea, P., Li, C. S., & Pickett, A. (2006). A study of teaching presence and student sense of learning community in fully online and web-enhanced college courses. Internet and Higher Education, 9(3), 175–190. Swan, K. (2002). Building learning communities in online courses: The importance of interaction. Education, Communication and Information, 2(1), 23–49. Tsai, I.-C., Kim, B., Liu, P.-J., Goggins, S. P., Kumalasari, C., & Laffey, J. M. (2008). Building a Model Explaining the Social Nature of Online Learning. Educational Technology & Society, 11(3), 198–215. Please feel free to share your feedback on this presentation on the following comment page. I’m still in the process of catching up on what I missed in week 5, but can’t find a recording of the panel discussion any longer. Can anyone point me to it? Thanks! First I go through newspapers and find a wide selection of editorial columns that address issues on a variety of levels from international to national to local issues. Next I split the class into groups and have each group select an article of interest to them (collaboration). Each member of the group is to read the article. For the next step, I set up discussion boards for each group where they can discuss the article. I provide them with some guidelines as to what to look for and things they should be able to identify such as what the argument is, what type of reasoning is used, what persuasion techniques are used and what if any faulty reasoning has occurred in the article (critical thinking about the article and the topic both). Also, they are asked to, as part of their group work, locate information defending or opposing what is said in the article (using technology). After having given them time to thoroughly discuss the article, usually a week or so, the group will be asked to create a presentation about the article they read and what their group discovered when analyzing the article (using technology/polished product #1). They present this via a link to a discussion board set up for this assignment (technology). Finally to add an individual element to the assignment as well, I ask them to write a letter to the editor of the paper the document was taken from either in support of the article or in opposition to it. In their letter they are to use valid reasoning, valid resources to support their belief (teaching researching skills), additional persuasive techniques, and avoid faults in their reasoning (polished product #2). They are to post this letter along with a link to their article in the class blog which I have set up (forum for project). Students also have the option of submitting their letter to the editor of the respective paper for possible publication (showcase for project). The goal is to have this entire project completed within two weeks time. Because students have to think critically about the topic being discussed to thoroughly understand what is being written about I feel like this project encourages them to become more involved in the world around them, at least for the topic at hand. From my understanding this project would serve well on a variety of levels. It would encourage critical thinking on multiple levels, it encourages writing for transfer in that they are encouraged to take the skills they’ve learned an apply them to a real-world situation (responding to the article), and it provides them with an authentic experience. I’m anxious to hear if others feel like I’m on track with my thinking. I’d like to hear what you think about this assignment — do you think it’s good, bad, or just plain ugly? What changes would you recommend I’d make? Also I’d like to hear what kind of assignment you use to fulfill some or all of these goals. I’ve seen lots and lots of ideas during this MOOC but I haven’t seen a whole lot of examples of specific examples. BTW if you like my idea, please feel free to use it — in my opinion, sharing is how we get some of our best assignment ideas. Today I was taking an online quiz in a MOOC (a massive open online course) and although I knew the correct responses, the quiz was marking my responses wrong. After reviewing all the related lectures and the corresponding readings for a second time, I was really puzzled. I was now 100% confident that the responses were correct. My next step was to review the Discussion Forums to see if anyone had a similar problem. Yes, I discovered a few students expressing their angst over the inaccurate grading of the quiz. You see, the question had not been framed correctly on the quiz and the students were indeed submitting a correct response. Now students were really frustrated with the fact that we could not contact the instructor personally. There is no option for emailing a private mail message or the staff managing the course. So students resort to the Discussion Forums pleading for assistance with a problem such as the situation I had encountered. Consider for a moment, as a teacher in the traditional classroom, would you simply walk into the classroom and introduce a topic with a brief 10 minute talk, then post a question on the board. After which you would then just walk away from the classroom. Never! Then why is it that so many online instructors believe it is okay to disappear from the virtual classroom? In the case of several Coursera MOOCs, the instructor does not engage in any discussion or one-to-one communication. When there is a situation that requires the teacher to decide the answer, we may need to wait several days or even a week. In the case of the quiz situation I shared above, the answer did not come until well into week 2. Unfortunately, the same thing happened with the Week 2 Quiz . . . which could have been avoided if the instructor had been aware of the situation with Week 1 Quiz. There is a clear absence of the teacher from the active conversation of the course. I have been in several Coursera.com MOOCs and each seems to have the policy that the instructor posts the weekly lesson, a few recorded lectures, and posts a question in the discussion board (occasionally). In the case of one course, the weekly lesson related board is simply a one sentence . . . "Discuss your questions regarding this week's lesson here." Teacher presence stresses that the teacher is not only responsible for the design, facilitation and direction of cognitive and social processes for the purpose of realizing personally meaningful and educationally worthwhile learning outcomes, but ensuring the students are comprehending the subject matter and progressing at an acceptable rate. My experience has shown that students prefer to have an exchange with the teacher rather than having to communicate through a staff member. The teacher should be posting probing questions that require critical thinking rather than a generic discuss here mandate. Without this involvement, the discussion posts are equally generic. The majority of comments are "I agree" and "Thank you for your response" type messages. Teacher presence requires the active engagement of the instructor as a role model and in order to measure the "pulse" of the class. Whereas, I understand that instructors cannot manage receiving 10,000 to 18,000 personal emails, but why can they not review the discussion posts. I have been active on the boards and I typically review all new posts once a day. It does not require more than an hour to comment on each of the discussion threads. My reflections in week 4 are a kind of mix of end of week 3 and week 4. So what did I do? I watched a recording of week 3 round-up and it felt like an “aha” moment – yes, I think I’m finally beginning to get my head round the Community of Inquiry theoretical framework And it’s about time too – I’ve seen/read about it numerous times, but what I found really helpful were all the annoying (!) HOW questions Greg kept on asking: So, how will that look? How can you stimulate learners’ interest? Ask lots of how/why questions to encourage students to think deeply. Give students a problem to think about and as a teacher/lecturer move from telling students to letting them discover/uncover. Think about how I could use the following during the online phases of my EFL/ESP classes: case studies, debate, roleplays i.e. each student chooses/is assigned a specific role to play, e.g. using “Hats”; current events to stimulate discussions. Community of Inquiry and the Buddhist parable with the blind men and the elephant. By working together, cooperating, forming a community whose goal is inquiry, they’d be better able to overcome their limited perspectives and discover the truth. “What you teach teaches you!” (so encourage peer teaching). And this was a great website on how to build an online learning community that I want to explore in the future. There has been quite a lot of discussion going on about audio feedback not leaving a paper trail – yes, this can be a problem which is why I usually give each student a written feedback sheet with minimal comments (like Tanya) which highlights the main good points/needs work points as well audio feedback. This means that I can also quickly look to see if a student has made any progress when resubmitting work without having to listen to my audio feedback. Jim & Julio – you both raised a very valid question, namely: “Do discussion forums gain anything from implementing audio threads?” I personally feel they do in my EFL/ESP classes, which is why I include this mode (and not only/always written forum posts). I feel it gives my students valuable speaking practice – German is their mother tongue. It also means I can give them feedback on their pronunciation, e.g. word stress, intonation, connected speech. Other things that I did: I read some of the suggested articles and listened to a recording of Debbie Morrison’s webinar on how to promote critical thinking in the online classroom, which I very much enjoyed – thank you, Debbie! Ask how and why questions – YES! Re teacher presence – students kind of know when the teacher is “there”; this maybe makes them try to do better – YES! A lot of work goes into creating the best conditions for students to learn in an online course – YES! It shouldn’t be confusing to students (what we ask/want them to do); any technology used should be in the background and NOT what students are trying to get their heads around – YES! When moderating online discussions: it’s a balancing act; be careful not to take over – YES! Students can be moderators – YES! Use rubrics to grade posts – YES! Provide feedback at the end of a discussion forum – can be a collective or individual comment. Share with the students why you’re having an online discussion – – YES! Shouldn’t just be “busy” work! From Greg: “Failure is an indicator for learning” – YES! Where did you get this example from? Can anyone see this from a different perspective? What assumptions are made here? Students introduce themselves and say what their 3 favourite websites are (first modelled by teacher). Small group guided discussion (recorded): teacher with 3 or 4 students on a specific topic; other students watch the recording and reflect/discuss the points raised. Listening to various presenters talking about the CoI over and over again was a good reminder that it’s a good idea to revise/revisit content more often. Thinking is driven by questions and not answers, so ask more, especially HOW/WHAT? Choose triggers for discussion forums carefully: ask more questions; start with a problem; be provocative/controversial. Yes, we’re more than half way through this MOOC – it feels like a long time probably because it’s been a pretty intensive time and learning experience for me. Thank you, everyone! Something that could be improved from my perspective (i.e. living in Europe/12 hour time difference) is the times of the webinars. Personally, I’d have preferred anything before 12 noon (Hawaii time zone). Would have meant that I could have joined in more often, which I really enjoyed being able to do on 2 occasions. But it was great that recordings were made – I presume week 4 round up was recorded? I want to watch that too Right, that’s me. I’m probably not going to be around next week, because I’m off to France (poor me!) with 6 girlfriends for a week, and I don’t think we’ll have internet access in the old stone house we’ve rented. But I’m sure that I’ll be able to catch up when I get back. So have a great week 5, one and all! Mahalo! And I’m not (quite) dead either! This week I’ve really had to pull out my thinking cap. I believe that teaching and encouraging critical thinking is one of the most difficult things we do especially on the collegiate level. 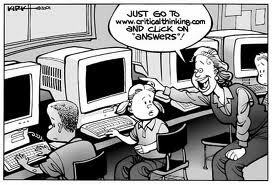 Often, especially now with all of the required testing, I find that students don’t know how to think critically. They have spent so many years in a system that has been so focused on teaching to the standardized tests, student aren’t given the tools to think much beyond regurgitating information spoon fed to them. To me this really causes issues on the collegiate level and leaves me wondering just what we can do to overcome this. I was hoping this week to learn techniques that could help. With that question in my mind, I selected items this week that I hoped would guide me toward activities I could share with the instructors I teach so that they could in turn use them in their online classrooms to encourage critical thinking. 1. Briefly describe what you did. This week I watched the two webinars (both the How to Promote Critical Thinking and the Engaging Students webinars) and was able to complete two of the readings. The two readings I selected were Online vs. Traditional Course Evaluation Formats and Critical Thinking in Asynchronous Discussions. I chose the first because I feel that the thoughts of our students can better help us design our courses and to determine what those thoughts are we need to evaluate our courses. I chose the second because I was hoping to discover ways in which we can encourage more critical thinking in the online classroom. 1. Describe why you did what you did. What are your feelings about what you did? Like I said before, I chose these items in hopes of getting more ideas about just how I could implement more critical thinking into the courses being designed and taught by the instructors I work with. For the most part, I felt a little disappointed in the material covered this week. I was able to gain a few things from Debbie Morrison’s webinar and from Greg Walker’s article, but for the most part, I felt like most of Dr. Elder’s session was spent explaining what critical thinking was. I was looking for specific examples about how to implement it into a training or class and how to engage student in that thinking. 2. How will this help you? I will be able to take pieces of what was covered in both the Morrison session and the Walker paper and use those as I design trainings and pass the information I’m learning on to the instructors I work with. The discussion prompts from the Morrison webinar will be most helpful as I can use these as suggested starting points for instructors. I will use what I learned from Walker’s paper to suggest to instructors how they might create better discussion boards that inspire more, deeper thinking. I learned that it’s important, especially on discussion boards, to ask probing, multidimensional questions that challenge students. I learned that when this is done correctly, students take their learning into their own hands and learn more from the experience. 1. What changes did you make? 2. What will you do differently in the future? I think the primary change I will make and what I will do differently in the future is to give more consideration to the types of questions I am asking for discussion boards and journals. I think that with slightly different wording I could make my questions much more effective when it comes to encouraging critical thinking and student learning. 3. What do you still have to learn? I would still like to know what others do besides asking probing questions to encourage critical thinking in their students. I know there must be more strategies out there that would reach out to a more varied audience of learners and I would love to hear about them. I’m not (quite) dead yet! Well, my participation in the course has dropped off significantly. I am bummed, because when I engage I find it really valuable. Ironically, it has made me give more attention to the online course I am teaching, which takes time away from this course! I basically have way too much on my plate- just moved into a fixer-upper, I have 2 jobs, working on my PhD, and being the primary caretaker of a 3 year old. I may just have to tune in when possible and pore over the archives over winter break! This was a very busy week for me at work – three blended learning courses started last weekend and one more started yesterday – and as usual there are always so many things to finalise, especially since I’ve been able to incorporate some of the things I’m learning on this MOOC into my course design. I finally got round to watching the last part of Sue Water’s webinar from week 2 on blogging and to posting a description of how I provide audio feedback on my blog – was in response to Jim asking for more details. And thanks to all of you who wrote back – yes, it really is encouraging when you get a response J I also listened to a recording of Monday’s webinar given by Heather Farmakis, read lots of blog posts throughout the week and responded to some. In a way, I was relieved that Sue Water’s blogging webinar was cancelled (postponed?) – it meant I had less to do/catch up on! My reading was very selective due to lack of time, so I skimmed a few of the suggested resources and only read a couple in more depth (from Jim, Jennifer, Sara and Anita) – these were related to discussion boards & grading, something that particularly interests me. All in all, I’m pleased that I was able to do so much despite having to do all the other things I had to do!. But I’m feeling pretty exhausted, in need of a break (the weekend is coming and I’m not going to do anything connected to work/this MOOC etc – but I think I’m not the only one who’s very busy at the moment! It was reassuring to discover that what I’ve been doing till now to get my learners to connect was fine – some of these I did intuitively, some by trial & error and reflecting on what didn’t work and adapting. But it was always clear to me that to get students interacting on forums the tasks had to be relevant, meaningful and manageable. I loved Heather’s idea of using her own online learning experience to introduce herself to her students – will definitely try this out with my next group of new students. I’m now far more aware of how important it is to write and use rubrics to grade students’ contributions to discussion boards and of informing students in advance of what my grading rubrics are. I have a kind of system either in my head or written on a piece of paper in my file but till now I haven’t really informed the students about what this is, unless someone asks. I think it’s a great idea to give student examples of exemplary, mediocre and poorly written posts. Yes, give some marks for participating (always did this), but only full marks for a valuable forum contribution. I’ve put together some tips on communicating online (including some of Rachael’s discussion triggers to encourage more meaningful responses) and have posted these on the VLE – will be interesting to see what difference this makes! I’ve been more specific about what students should include in their forum posts, e.g. 3 things you’ve learnt, one thing you agree/disagree with and why, 3 similarities and/or differences etc. What now? What do I still have to learn? I’m still very keen to learn more about setting up and grading forum posts, since like, Heather Farmakis mentioned in her webinar, I also believe that online discussion boards are “the heart of online courses”. Enough for the moment and I’m now looking forward to the weekend and then to week 4! Audio feedback and human touch? Voice recording tools: I use a digital recorder, an Olympus WS-311M, which has an in-built microphone and USB port for easy uploading to a PC/VLE); my colleague prefers her mobile phone. PCs/Macs with voice recording functionality can also be used for recording audio feedback; software and apps include Audacity, Vocaroo, Audioboo and Voxopop (just Google them). How? The procedure we have found to be most practical is the following. After reading through the assignment, inappropriate parts are annotated with the corresponding correction symbol (for language problems), and numbers are added to help the student identify which part the tutor is later referring to in the audio feedback (AF). Each recording then starts by the tutor personally greeting the student, followed by a brief, task-related, encouraging comment. The tutor then outlines how the feedback is organized (depends on the marking rubric) and talks the student through the assignment i.e. tips as to how the he/she could improve content, language, and organization are given, referring to the symbols, numbered parts or paragraphs to help the student pinpoint the part being discussed. As in normal speech, incomplete sentences, repetitions, slips of tongue, fillers such as ehs & uhms and pauses occur and can be ignored. The intention is to be as spontaneous and natural as possible, simulating a face-to-face situation. A final, positive, constructive remark concludes the recording. Audio files (with the consent of the students) are then uploaded to the VLE together with the annotated assignments for students to access. After listening to the feedback, they edit their assignments accordingly and re-submit for final assessment, thus hopefully benefiting and learning from the feedback received. Why? Compared to written feedback, students value the fact that audio feedback is more detailed, more personal and thus more helpful. Our other usages of audio feedback are to comment on tasks and reflections students submit in connection with their SDL, to provide pronunciation feedback on spoken tasks done during online phases, and to record our reflections on end-of-course evaluations. Screencasting: The other audiovisual tool I use to provide feedback is Jing (http://www.techsmith.com/jing.html). Jing is free screencasting software which enables you to make a short video (maximum 5 mins/no editing whilst recording possible) of what is on your computer screen. How? We have been using Jing to provide digitised group feedback to our students on language errors (documented in a Word file) from their online forum postings. This means that students are able to watch a video of the tutor talking them through and simultaneously onscreen correcting the errors in the opened Word document. The link to this screencast (saved on the Jing server) is embedded in the course outline on the VLE for the students to access whenever and as often as it suits them; it can also be mailed to them. We have also used screencasting to show students how to use technology and to virtually introduce an ESP course that started with an online rather than a F2F session. All in all, I feel that by using voice recording and screencasting tools, we can now provide more personal, more meaningful and more effective instruction in an acoustically and/or visually supported manner. Intonation and voice tone both help to convey feelings, which in turn really help to create tutor presence and build rapport (the human touch). Finally, since students can decide when, where and how often they listen/watch, an element of choice is added, an important step towards promoting learner autonomy. What do you think? Would voice recording/screencasting be feasible in your teaching situation? I’d be very interested to hear from anyone who has some experience of providing audio and/or video feedback. This week I was another crazy one in my life. I had planned on doing much more, but I only was able to respond to a few blog posts and attend the one webinar, which I found to be quite informative. 1. Describe what you did. What are your feelings about what you did? As I previously stated I was able to respond to a couple of blog posts, although I didn’t get around to reading as many of your posts as I had hoped. Also I participated in Dr. Heather Farmakis’s webinar about Creating Community. I found this presentation to be quite helpful and I felt quite positive about approaching discussion boards differently after I sat through this session. I think what I learned I can easily implement into the trainings I design and hopefully the instructors in these trainings will take upon these cues and implement these ideas into their own classes. I think that by doing things such as presenting two discussion options will encourage and increase trainee participation because when presented with options, they students will be able to pick a topic they feel comfortable writing about. Also I can see myself using more group projects after I heard suggestions about creating discussion boards for individual groups. I think that this might be a way I could implement groups into an asynchronous class. I learned that what works in one scenario doesn’t necessarily work in all scenarios. I’m not sure that matching protocols and aligning due dates among instructors such as was suggested in the webinar is something that will happen at my institution, it does occur loosely simply due to the way in which our online classes are designed. At my school all of our online classes follow a basic course shell and are designed so that each class is presented in 8 modules. We do this so that the material can easily be broken down into 8 week (1 module a week) or 16 week (1 module every two week) sessions. With this in mind, many of our instructors have similar due dates, but if we were to align all the due date exactly as I understood Farmakis to propose, I think it would meet with a great deal of opposition from instructors who believe such an alignment would infringe on their academic freedom. I also learned that giving the students options — such as having two discussion board forums for a student to choose from allows students freedom and encourages participation while at the same time meeting course objectives. I think that among the changes I will be making as I design future trainings will be to include multiple options when it comes to discussion board postings. Students may not feel comfortable writing about a particular subject and having options allows them to feel that they can more freely express themselves. I also am going to take something learned last week and change the introductory discussion post that I ask for in each training (and was discussed as a good practice in the webinar) and have the students present that in a video format to allow students/trainees to get to know each other a little better. I feel fairly confident now when it comes to discussion boards. I do, however, still need to learn more about using other collaboration tools such as wikis and blogs (especially wikis). I’m anxious to hear how others use these newer communication tools in their online classes. Building rapport – when online can help face-to-face. This week I’ve been thinking about building rapport in the context of blended learning where the learning technology (a VLE) plays a supporting role to a predominantly classroom based course. In hybrid learning the role of the VLE is often seen as being that of a repository for resources. When faculty start using a VLE they often begin by uploading course handbooks, lecture slides or recordings and reading lists. I can understand that – the physical space of face-to-face classes it’s supposed to provide human interaction, discussion and activity, which leaves the online space to act as an archive and source for further study. But face-to-face classes are changing. Student numbers are growing and lecturers don’t necessarily have the opportunity to interact with all the students on their module. A convenor may be delivering the weekly lecture while associate tutors are teaching numerous seminar groups. The VLE provides a platform for the lecturer to develop a relationship and rapport with her students between and beyond the lectures. Forum: where the lecturer can introduce herself and students can ask questions related to the lecture or the module as a whole to be answered by the lecturer in an informal, friendly tone. All the students will be able to see the answers and contribute to the discussion with follow-on questions of their own. This online learning space can also be used for questions that arise in the lecture or in seminars. The lecturer can also use this forum to suggest additional useful resources. RSS Twitter feed: the lecturer could embed their Twitter feed in the VLE and share interesting tweets with students (this might necessitate a separate professional Twitter account). Online quiz with lecturer feedback: A quick quiz either after each lecture or after a block of lectures letting students check their learning and get automated feedback from the lecturer. This also provides the lecturer/convenor with feedback to inform lecture planning (which topics are students comfortable with, which need revisiting). Can you think of any other examples of a VLE or other online learning platform being used to build rapport in a classroom based course? Am I a hybrid teacher? I was on holiday for most of this week so I didn’t do as much MOOC study as I could have. Notice I didn’t say should have. I try to remember that the relationships between the physical, emotional and professional / productive aspects of our lives are important and nurturing ourselves is an essential precursor to nurturing our students so I’m not going to beat myself up about neglecting the course. I also have good authority for not getting too fixated on ‘completing’ all parts of this course. Stephen Downes who spoke at the Association for Learning Technology (ALT) Conference last week advocated viewing cMOOCs like this more as resources than courses as such. Thinking about this made me realise that my approach to this MOOC is one of selective learning and the things that I choose to focus on and what I get from them are unlikely to match exactly what anyone else gets from the ‘course’. The aspect of Tony Bates’ talk that particularly interests me and relates most closely to my professional practice as an Education Developer / Learning Technologist working with staff teaching campus-based courses, is hybrid or blended learning. In particular, I’ve been thinking recently about the ways in which online components are becoming more integrated into campus courses. Bates referred to flipped classes but suggested that there were more possibilitie. This overlaps with some of the things I was hearing about at ALT-C last week (and blogging about in terms of face-to-face using online tech and campus courses learning from online ones). How might my own teaching be, or become, hybrid? I run some face-to-face workshops for staff in which I try to take a student-centred approach and tailor the content to the learners’ needs. Although classroom based, these sessions are supported with online resources. Far more of my work has been in one-to-one situations with staff taking a professional development course. This involved regular meetings, discussions, observations of their teaching, lots of informal feedback and ultimately assessment of their portfolios. I also produce materials for a website, blog and paper newsletter and collect and curate a lot of resources that I hope lead to informal learning. This all sounds pretty hybrid, right? But just because my practice is spread across a range of activities doesn’t mean that the learners I work with are experiencing hybrid learning. Some clear examples of hybrid/blended learning innovations I’ve been involved in would be the use of online quizzes to provide feedback to students on a campus-based course, or the use of Student Response clickers to increase engagement in a large lecture classes. These are the sorts of innovations people like me support and disseminate, but the techniques rarely translate well to the sorts of teaching that we do ourselves, where numbers tend to be smaller and workshops are one-offs rather than part of sustained modules. I have to reflect, then, how appropriate this MOOC is for me. I want to learn about teaching online because colleagues will increasingly need to think about how to do that, and will want advice and guidance, but I get very little opportunity to put that learning into practice myself. Am I already teaching online, albeit in an informal way? I think that the answer has to be ‘no’. There may be some informal learning resulting from my activity, but can there be informal teaching? In the absence of ‘appropriate learning goals’ and designed ‘course structure and learning activities’ I don’t think that I can claim to be ‘teaching online’ as such. I do try to ‘communicate’ as much as possible and in as many ways as I can, but the possibilities for evaluation are limited so innovation is generally born out of curiosity. I have written elsewhere about my efforts in Curating and Communicating as possible ‘e-routes to disseminating and sharing good practice among teaching staff’ but although these are intended to stimulate learning and in particular the sort of networked learning that we are experiencing in this MOOC they do not feel like ‘teaching’. Would the things that I teach formally work online? That is an interesting question. Many of the workshops I run are introducing staff to using learning technologies and trying to do that online would probably be unhelpful. Face to face and hand to hand interaction is really important when grappling with new equipment or software for the first time. Other teaching and learning topics could potentially be addressed through online modules, but feedback on staff development workshops over the years has consistently shown that the opportunity to meet other members of staff and share experiences has been one of the most valued aspects of the sessions. It seems unlikely that the same level of sharing and peer support could be achieved in an online context unless the topics were tackled as part of a more substantial course where a meaningful community could be established over time. So, is my teaching now, or could it become, hybrid or blended? To the extent that the face-to-face workshops I run are supported with online resources they are minimally hybrid/blended. The wealth of online and networked resources I curate and communicate to colleagues provide opportunities for them to get involved in informal online learning alongside / beyond any formal sessions they might attend, but these are not part of any structured hybrid/blended learning design. Some topics that have been taught face-to-face could be taught online, but the benefits of this seem limited when staff are all based locally and sharing experiences with colleagues has been such a valued part of professional development workshops in the past. Okay, so I learned a lot from Mr. Myagi. When it comes to connecting with students, here are a few good ones I got from Sensei. 1- Confusion is okay. Students aren’t just allowed to get frustrated and confused- confusion is encouraged. As a matter of fact, I remind them repeatedly that when they get to a point when they’re about to pull out their hair and quit, they’re right where they’re supposed to be- this is where learning happens. Just as a body builders lifts weights to tear muscles apart to make them stronger, we too must tear our old ways of thinking apart so that we can learn, build empathy, and discover solutions to real world problems. 2- Mutual respect is important. I call them by their first names, so I ask them to call me by mine. Did Mr. Myagi do that? Not really, huhn. Well, calling the kid Danielle-san always sounded really familial to me, like Mr. Myagi was calling him “son”. I know that it’s really just my bad understanding of Japanese, but I think that in today’s student/teacher climate, going out of my way to let students know it’s okay to call me by my first name will help them speak to me more easily. I hope it makes them more comfortable shooting me an email and asking questions. I think it’s working. 3- Repetition is good. I lucked out and get to teach composition, and I know that students need a lot of practice learning how to write in a logical fashion. They need practice working with sources; they need practice presenting the works of others and practice responding to those ideas. They don’t show up with these skills, and why should I expect them to? So there’s a lot of repetition of skills on different topics. I have to repeat myself a lot. Some of them get it the first time, some of them might get it after 16 weeks. I hold on. I try not to get frustrated. We repeat. I think of it like building muscle memory so that when they go into other classes, or go to work, or even have to work out disagreements with their families, friends and neighbors, I want them to have communication skills. I want them to be able to listen to others closely, and I want them to have ways to respond. I want them to know that their ideas matter. I want them to have techniques for dealing with people they don’t necessarily agree with when they still have to find a solution to a problem. I want them to be eloquent, just as I want them to understand the beauty of clarity and brevity. So we repeat and wax on and wax off and wax on and wax off. Week 2 Reflection Activity — WOW What a Week!! This week was a hectic one both at work and at home. There was so much going on in the MOOC this week I’m not sure I absorbed as much as I would have liked, thank goodness it’s all recorded and I can go back and review. With this in mind, I’ll try to put everything into words, I just hope I can do it justice. 1. As I said, this was a busy week. I was able to take part in Dr. John Thompson’s live webinar which was very interesting. I also “attended” the recorded versions of the webinars presented by Melissa Kaubach, Sue Waters and Dr. Larry Ragan. 2. Like last week, I attended each of these presentations with hopes of gleaning something I could share with the instructors I work with. I’m glad I did because I felt there were several things I could take away from what was covered this week. From Dr. Thompson I gained assurance that some of my previous thoughts about group work and online office hours were in fact supported by others. From the discussions I was involved in about the webinar, I learned that some had used group work and online office hours with success. Moreover, I learned some strategies for making each of these work. Also during this session I learned how overcoming the lack of non-verbal communication adds to the success of online students. That being said, I was able to take suggestions from Melissa Kaubach’s webinar and explore some new ways to overcome non-verbal challenges while at the same time adding the human touch to online classes. With what Melissa Kaubach’s presentation in mind, I decided to accept her challenge of creating videos to reach out to online students and chosen to present the rest of my blog this week in the form of a video so that you can perhaps get to know me a little better. I totally agree that respect, approachability, open communication, caring and having a positive attitude apply in all environments. And as Greg said yesterday, it’s basically how we are in real life with people, family and friends! How do I do this? I teach blended learning courses, so get to see the students F2F approx. once a month anyway. I usually start with a ’3 secrets about myself’ activity, where students have to find out why 3 facts – dates, names, numbers etc are important to me. They then do a similar getting-to-know each other activity. I demonstrate my teaching philosophy live, so in an online course would obviously have to explain this – which I also do briefly F2F. I instant message my students if I see them on the VLE – just a quick: Busy? How’s life? etc. They always respond. I agree with what other participants have said about getting to know your online learners better than the full-time students. But this takes time! Time and workload management is an issue in online teaching (OT) so Larry Ragan’s slide with ‘Be aware of the “blurring of the lines” between work and life’ resonated with me. Interesting that work isn’t life or life work!!! Also that OT is 30% more time consuming than F2F, at least when you start – YES. And I think our institutions don’t realise this, maybe can’t unless they’ve actually done it. Finally, I think it’s SO important that you like what you’re doing, are hopefully even passionate about it – in this context, teaching and that you like people/your learners. From Sue Water’s recording I heard that there’s research confirming that writing for a real audience and not just for the instructor results in better content, better organization, and longer texts (but not sure the latter is actually better!). So far I’ve not used blogging in my OT mainly because most of my students have ePortfolios where they document the self-directed part of their learning. But apart from me, I’m pretty sure no one else reads/comments. So, I’m now considering getting the students to peer review and comment on each other’s work on their ePortfolios – till now I’ve only done this F2F in a kind of “show & tell” session – provides authentic speaking practice. “The majority of contemporary online classes focus on transmitting a knowledge base to the student rather than stimulating the process of learning.” – from this source. I learned from being live in a webinar how nice it is to see each other’s face, i.e. putting a face to a name/post/voice! I noticed I was hesitant about turning my video on – but I was in bed ( it was 1am! ), and that it’s so much easier to speak and let/get participants speak when there are not too many taking part – something I’ll remember if I set up webinars. In connection with making videos: I’ve learned to avoid dating intro videos i.e. not mentioning assignment dates etc, – means you can reuse them; to be casual i.e. not sitting behind a desk; to consider what’s showing up in the background and to have enough light shining on you from the front! Something I already knew – that online teaching/learning is very time-consuming, which is why I’m NOT going to create an extra artefact this week – no time! I’m starting 2 new blended courses tomorrow and have included a getting started slot with a wiki and forum activity that won’t be graded. And I’ll probably be a lot more understanding when they all looked shell-shocked on day 1 (I start with a F2F session), and will tell them about how I felt at the beginning of this MOOC! I’m definitely going to use some of Rachael’s discussion triggers to encourage more meaningful responses on forums – see my previous post. What do I still have to learn? Some things that instantly come to mind are that I’d like to learn more about getting students to connect and about grading forum discussions. I still need to learn more about blogging – the technicalities of linking, adding media. And I hope I get to hear something really NEW next week. Two comments/thoughts to finish of with. “Enjoy your teaching because if you don’t, who will!” (Ben Goldstein, I think). What do you think? This week, I learned about ways to build rapport with students online. Frankly, I never realized how important it is to add a personal touch to the online course, until I read this week's articles and watched the webnars. I tend to shy away from sharing personal information on line, and I would have never imagined to shoot an introduction video by my pool with my pet on my lap. So, looks like I need to change my expectations slightly. I liked the Prezi made by Heather Farmakis. This presentation made me want to start using Prezi as a teaching tool. So, here's the summary of what I learned about building rapport with students. During the 1st week, create activities to get to know each student, such as introductory survey and pretest. I suppose this is similar to an index card I used to have my students fill out on the 1st day of class. In face-to-face class, I have my students write their course expectations, what they already know about the subject, etc on an index card. I used this information during my course to address any question they may have during specific topic or try to tailer my lecture to some of the students interest. Blogging is a good tool for building global collaboration, and show case students' work. Students will perform better for authentic audience. Blogging can be used for introductory activity or classroom projects. Respect for each other and to the institution. Perhaps at the beginning of the course, have an honor code/ code of conduct posted and clearly stated about what the expectations are on posting comments. Every students have their preferred method of communication and the instructor should be able to accommodate that. Hold an office hour at least once a week for a few hours. This is where the instructor is logged on and able to respond to the questions. These information should be clearly stated and informed to the students. Weekly (3 times a week) email updates from TOMOOC course has been great. Define parameters and let them know. Students do not expect you to be available 24/7, unless you give them that impression. If faculty cares about students, students will do better in class. Refer to students by their name in discussions. Make personal connections with students, especially those with extenuating circumstances, missing classes etc. Let the students know that you believe they are capable of doing the work and you are available for help. Send encouraging or job well done emails, or just include a note at the beginning or end of an email. Make the course friendly- use of animation, emoticons, humor etc. This was my reply to a great discussion which was initiated by Dean and to which Lori and Rachel added their thoughts too. Great discussion so thank you for initiating it, Dean, and to Lori and Rachel for their thoughts. Here are my 2 cents! Rachel’s triggers: I usually provide more explanation of what is expected from a post and response. For the response I include something like this: Read your classmates’ posts throughout the week. Reply in at least two well-thought-out paragraphs, to two (2) classmates’ postings by . Go beyond a “yes” or “no” or “I agree”. Give them advice, ask them questions to clarify, suggest alternatives, extend on an idea, offer a resource link for more information, or otherwise engage with one another’s comments. E.g. I was intrigued…; When you mentioned that… it made me wonder…. ; Have you thought of…; What about…? 2) Re assigning some of the course grades to participation – totally agree with Lori. My Master’s students all work full time, so they’ve got to prioritise when it comes to deciding what they do. No grade is unfortunately equivalent to not necessary/important – I’d probably do the same too. And as I mentioned in a previous posting, it’s then entirely the student’s decision as to what they do, which I respect. Ok, so I have been thinking about the various suggestions and it seems like again and again, we keep hearing about encouraging group work with online students. The more I think about this, the more I am inclined to break out the black hat. I just see too many problems associated with group activities with online students. This may come from too many bad personal experiences in my own online undergraduate and graduate studies, but I really think many others also have the same opinion. After watching Dr. Thompson’s webinar yesterday, I was almost relieved to hear one thing he said. It was somewhat reassuring to hear that he had also noted that most online students don’t like group work. I tend to believe what Dr. Thompson said in yesterday’s webinar. I agreed with Dr. Thompson on two points. I felt like he made a valid argument when he said that most online students don’t like group work because of bad experiences. It is probably my own personal bad experiences that have soured me most about group work in the online environment. On several occasions as I completed my studies as an online student, I was assigned group work projects. More often than not, these projects turned out to be a failure in my eyes, mainly because I felt like my grade was pulled down because some in the group didn’t live up to their responsibilities to the group. I felt like I was taking online classes for a reason — to be independent in my learning. I hated when my grade depended upon someone else. Another point Dr. Thompson made which I strongly agreed with was that in many ways having online students do group work is at odds with the asynchronous nature of online courses. For group work to be done right, students need to be able to collaborate and for students with varying schedules in multiple time zones, this is not always feasible. I cannot see how on one hand you can tell students that one of the advantages of online work is that you can work at your own time schedule and pace while at the same time expect them to be able to ”meet” classmates online to participate in a group assignment. While I admit I’m very adamant in my feelings about assigning group work to online students, I will also listen to other points of view. I’m interested to hear what others have to say about group work for online students either in support or in opposition. Please respond and let me know about your feelings and even your own experiences whether those experiences be as an instructor or as a student. The top 5 characteristics of an outstanding online teacher (from a student survey, I think): communication/availability, compassion, organization, feedback, instructor sharing personal info. I think our facilitators are doing a pretty good job as far as caring and presence are concerned – thank you! As a social worker, I was taught to use reflective practice as part of my regular routine. I've enjoyed that this community has been about sharing and reflecting. Making sense of material and trying to see how it relates to us educators. The "What? So What? and What Now?" and reflections and sensemaking activities that have been presented as part of this MOOC has impacted so much, that I've adapted it for my class. I struggle with my role as an educator. I am caught between the paradigm that was my experience and that which I am told is best practice. In social work (and other helping professions) our roles are often that of guide. I use this idea of being a guide in my role as an educator as well. My students are at various points in their learning process. I know and appreciate that I only have a brief amount of time to help them acquire the knowledge and skills that are set for the course, knowing that mastery of the material will be a long-term goal they achieve well after the conclusion of the semester. This approach of being a guide is different then my academic experience. In trying to move myself towards this new way of educating, I have no model of comparison. So as I spend a class period doing activities, I think back to the lectures that I was exposed to and wonder if I am doing everything wrong. The responsibility of preparing these learners to be the leaders of my profession is daunting. I worry that I do not do enough to prepare them to be successful. I wonder how much I must do to create a experience that will motivate them to do more and to do better. Perhaps is the best thing that I am always questioning if I am doing things right, it keeps me thinking of how to improve myself and my class. This semester I started a few new things in class. I end each class with a closing protocol where I ask my students to provide feedback on: what they learned; what they would change; what went well; and what they dislike. They can also provide a "Tweet" of the class or use 6 words to describe what they learned. I am hoping that by doing this, I can adapt to their needs and that I can tackle any issues or concerns before they become a problem at the end of the semester. By collecting the feedback, I am able to gauge what is working and where I may be missing the point I also started a new "living" assignments and readings document. This is a Google Document that I update ever week. Based on class each week, I add new content for them to read in future weeks. My goal is that they see how fluid a class must be for me to guide them on this journey. The funny thing is that in doing this Blog, I am gaining an appreciation for the work that I ask of my students. Here I am, trying my hardest to complete an assignment and turn it in before it is due. A Wordle of my week 1 postings. Not surprisingly, students, learners, online, content, teaching, learning, outcomes, skills, and time are prominent – hence frequent, as well as done and want, meaning done a lot but still want to learn/do more! I use Wordles in my teaching as a way to introduce/summarise a text and for vocabulary work. A. Briefly describe what you did? This week I attended all three webinar sessions as well as read several of the posted documents. A. Describe why you did what you did. What are your feelings about what you did? I attended the Dr. Dreon session hoping to gain additional understanding about the reasons we teach online. I thought that maybe there were motivations other than those I was already aware of such as distance, flexibility, etc. I attended the wrap-up session because I thought maybe this might give me an opportunity to catch any information I missed during the week. This was a good summary and it provided a nice overview of the webinars that were presented. Additionally it pulled in some of the reading information which I think is helpful to some. When it comes to reading the posted documents, the ones I focused on were: 22 Secrets from the Most Successful Online Educators, Implementing the Seven Principals: Technology as Lever, Applying the Seven Principals for Good Practic to the Online Classroom. Exploring Online Teaching, and Ten Best Practices for Teaching Online. In regards to these readings, I found that I was already familiar with much of the information contained within them. Also I felt that each document presented pretty much the same material just using different terminology. With that in mind, looking back on it, I think I could’ve gotten by with just reading one or two of the documents rather than the whole pile. B. How will this help you? All of these exercises added to my knowledge level about MOOCs in general and teaching specifically. While I didn’t necessarily find anything new in much of the information, I did discover that there was more research out there that I thought to back up what I already knew. I did learn how to find some of the articles so that I can provide them to the instructors I work with so that they can see that there is support for what I’m trying to show them. C. What did you learn from the experience? I learned more about MOOCs and how they work. I also learned that a lack of structure causes many learners to become frustrated with using MOOCS. After coming to this realization I am left to wonder if the lack of structure and the frustration it produces are part of the reason so many students that enroll in a MOOC don’t complete it. It seems that a defined structure with at the very least defining learning outcomes such as those found in most credit online courses is desirable in a MOOC. Another thought that I didn’t really learn but actually had reinforced was the importance of communication. Until it was mentioned here, I didn’t realize (or at least never had given much thought to) what the differences were between distance education and correspondence education and that the major difference between the two was the communication level. However, I still wonder if a student taking an independent study through distance education doesn’t actually fall within the definition of correspondence education since the communication is basically between just the student and the instructor. A. What changes did you make? I’m not sure I will make any changes. At the school where I currently work we have a very strong online program that provides blank course shells to instructors. This ensures that all students are getting the same information. Because of this though, the instructor is actually more of a facilitator and many times is just grading assignments that have already been created for them. The main thing I can do is present what I’ve learned to our designers and hope that they will incorporate some of these skills into the courses that they are designing. B. What will you do differently in the future? Again, I think that the main thing I can do is to present the information to our designers and encourage them to increase the amount of communication in the courses that they create. C. What do you still have to learn? I believe I have a pretty sure foothold on the fundamentals. I would like to learn more about things such as how to get students to participate. Also I want to learn more about teaching techniques such as how others reach out to various learning styles using the online environment. I feel like I’ve come a long way this week. My understanding of MOOCs has improved to the point where I’m experiencing much less frustration. I’ve participated with some blog responses that have led to some interesting discussions which got me to thinking about how I do things. I think it’s been a good week and an I look forward to seeing what next week brings. What I did this week: I watched Tony Bates’ talking about the Nine steps to quality online learning and making notes on what I found memorable/useful for my teaching in my blog. I then scanned the remaining suggested texts and read those I found relevant/interesting/practical. I also read numerous contributions from participants and replied to some (and got replies back – thanks!). I’ve added a widget to my blog – I found out what links are and have now linked a few blogs to mine – great! And I eventually got round to watching the recording of Tony Bates’ webinar Similarities and Differences between MOOCs and Credit Online Courses, and documented my thoughts in my blog. So what? I did what I did because I was inquisitive, because I wanted to get going, to find out more about online learning/teaching and not to lag behind. But I knew I couldn’t do everything/didn’t need to do everything. I was pretty busy at work this week and at times was a bit frustrated that I couldn’t watch the recordings (still have one more to go) or respond to more posts. I wanted to join the weekly round up – time-wise it would have fitted – 10pm where I live – but friends came round for dinner, which was more fun! Yes, all in all, I feel fine about what I did – was enough! I don’t want this MOOC to get out of perspective, to consume me. Do I really want to be sitting in bed at night reading and answering posts, or doing this at breakfast instead of chatting to my husband? On the one hand, yes – I’m intrigued to know how everyone else is getting on, but maybe my timing is wrong! STOP! I need to prioritize! I learnt/was reminded of lots – here are some of the things in addition to what’s on my blog. My next blended learning course starts in a week’s time, so I want to be more explicit i.e. Tell students that I monitor forums and respond quickly. Show students IM/ping function – encourage them to send each other short pings. Remind students of deadlines – highlight on start page; maybe send them a short class update/message. Compare the online task outline to a to do list – it’s satisfying to tick things off when done! Remind students of expected weekly workload and to work regularly, maybe to schedule learning times during the week. How to use Skype more in the online phases, e.g. set regular times when students can meet me on Skype i.e. during my office hours; get students to do tasks in smaller groups and then discuss their outcomes on Skype. What this really means: apprentice-like learning – like this expression! Tony Bates/tips – designing student activities is the most critical part of the online design process. Planning a good closing and wrap activity for the course. I learnt from this experience that setting priorities is important, and that you need to spell things out for students so that they know what to do, when and why. I kind of knew that anyway but this reminder was good! I was getting into a bit of a mess not knowing who I’d responded to, which blogs I was interested in etc, so I’m now saving this info electronically (iPad/notes). I’ve changed the first online activities that one class will do (intro to forums, wikis). I’m thinking of making a screencast (using Jing) to demonstrate how to do various tasks – better than long explanations. I’d like to learn more about the different features/functionalities a blog has – one step at a time! I still want to learn more about designing quality online activities and applying this to my teaching (ESP/EFL). I now know that I want to put together a list of online teaching tasks (i.e. from my perspective as a tutor) – will be my artefact but not for this week/not enough time. But I’m thinking about it all the time! So I want to learn more about this. I still have to learn how to document things more efficiently. I still have to learn how to wear different hats when I comment on artefacts. Watched the recording of Tony Bates’ webinar Similarities and Differences between MOOCs and Credit Online Courses and here are my reflections/aha moments and a couple of issues (red) I’m unclear about and would welcome comments on. Refering to the article we should have read before this webinar – TB: Don’t take for granted that students have actually read through assigned materials or done tasks! Question: Should we then spend/waste time on going over it again? Will this not just encourage students NOT to prepare? Or is it a good revision activity? Online learning: quality of activities often poor. Greg mentioned that instructors tend to focus more on delivering content (e.g. videos of lectures) than on designing good quality, meaningful activities. This IS difficult! Most universities claim they are educating students to be critical thinkers with higher order skills but don’t – they focus on content delivery, which is out of date within a few years. TB: Focus on being clear about what students’ learning outcomes are. How will I know students have achieved them?How will I assess these? Structure refers to content delivery as well as activity design – both can be strong or loose. Should be no looseness about learning outcomes – what learners need to be able to do at the end; also what learners must do each week. Outcomes should be clear, how learners get there can be loose. Can negotiate/identify individual learning outcomes for each student. Artefact - creating a piece of work that learners can share with other participants – bit confusing to most people! Mine is going to be on putting together a list of online (language) teaching tasks to share with my colleagues. Rubrics for assessment of artefacts? – yes – assessment shouldn’t be a guessing game for learners. TB – how assessment is done will radically change, from tests – portfolio, i.e. learners showing what they’ve learnt/can do, and how they’ve progressed. Assess achievement of outcomes e.g. CoP – could be to identify 6 people you will share/network with. Peer review for grading purposes: According to TB, it has to be monitored, there should be clear rubrics, learners need to roughly at the same level of proficiency for it to be successful. I also get learners to peer review each other’s written assignments online (using rubrics) before submitting for marking. I’ve learnt that if I “sell” the idea/the benefits at the outset, it works better i.e. students are more convinced and more willing to participate (I also give them credit for peer reviewing activities). How the above applies to my teaching situation and another question (at the end): A part of the blended learning Professional English classes I teach has a self-directed learning (SDL) aspect, where learners choose a specific area which they want to develop – either language, or skills. They formulate a goal: e.g. By the end of the semester, I want to be better able to understand the gist and main points of journal articles about wine marketing. They do the work, document tasks, time spent (they are aiming to spend in total about 20-25 hrs/semester) and also write a brief reflection on how useful, difficult, easy etc the task was. At the end of the semester, they write a reflective report summing up this learning experience and submit this report and the work done – some of the students do this electronically on their ePortfolios, some on paper, some do a mixture – for grading. They receive the criteria in the form of a rubric at the beginning of the course. I then grade/give them audio feedback on task achievement in general, and language used in the written report (they get input on how to write a reflective report and are supposed to demonstrate a degree of mastery here). Basically, grading is highly rewarding though quite time consuming since it’s extremely gratifying to read and see what the learners have done autonomously and how pleased they usually are with the outcomes. All in all, the majority see SDL as a wonderful opportunity to work on the English they really need either professionally or privately at their level of proficiency. My issue/question: One thing I’ve always had a problem with is whether I should really be marking their English in the report – is this really part of their SDL. Part of me says yes – they should learn/be able to express their reflections in decent English (the report constitutes 15% max. of the final SDL grade). But part of me says no – the language in the report (as long as I can understand what they’re trying to convey) has nothing to do with their SDL. I’d be really interested to hear your views on this bearing in mind that this is an EFL/ESP class. I’ll finish off with an analogy used by Tony Bates: a MOOC can be a bit like a journey of discovery – yes that’s what I’m finding too! I saw this post on the course website and I really liked the idea of using this questions as an assessment tool for student learning and teaching feedback. It's basically a list of question to students asking for anonymous feedback on the class. Questions ask students to identify most engaging, distanced, helpful, confusing, and surprising moments in the class for the week. I liked that the answers are anonymous and that the collected answers will be shared to the group. How Do I Facilitate Students Trying to Create Their Own Learning Experience? I’m an English comp instructor. I see my class as a space where students learn new skills rather than absorb content. I feel like a coach, and I want to create an atmosphere where we think of writing as practice. I want my students to try new things, make mistakes, wrestle with their gators, open their minds to new ways of thinking, and then walk away with skills they can apply in their other classes and in the outside world. Thus, I’ve always thought of composition as a skills-based class rather than a content-based course. Nevertheless, we study the art of writing and, in that, I’m definitely the expert in the room. Ha! Room. Online everything is different. This idea about letting students go at their own pace scares me some. I need papers in by certain dates; otherwise, my work load becomes impossible. How can I be more flexible for online students? Ugh. I have to give them feedback on their papers, so if they turn in assignments at different times, I’ll lose my marbles. Also, if the class discussions are to help them brainstorm and pre-write, how can they work ahead? Being more flexible on timing sounds a little impossible right now. This idea about letting students create their own learning experience is throwing me a little. too. Can I create a course where students get to pick and choose which assignments they want to do? Is that possible? Perhaps I can create multiple assignments that would satisfy the learning outcomes. Then, students could pick which assignments to complete. Is that what it means to let them create their own learning experience? Perry Samson of the University of Michigan gave a very lively and engaging presentation at ALT-C about LectureTools, the software he has developed with Echo360. The session was titled ‘Deconstructing the Large Lecture Environment Through Technology‘ and as Perry talked about students using mobile devices to make notes, ask and answer questions or just signal confusion, the potential of the technology to close the gap between lecturer and learner in large lecture classes was very clear. He also talked about this suite of tools meaning that students, or even himself, did not have to be physically present in the lecture theatre – raising the possibility of distance learning. And then it occurred to me that we can no longer really draw distinct lines between classroom/f2f teaching and online teaching. Certainly where I work we already record lectures and in the interests of inclusivity it is standard practice to post lecture notes on the VLE in advance of teaching sessions. Every module has a VLE site so there is an online component, though the extent to which this is used varies. The tools being demonstrated today were impressive, but mainly because they brought together things that we already do or could do, in one place: there was the ability to set questions and poll answers from students (as with response system ‘clickers’, Socrative, PollEverywhere etc.) and take questions from students (as with Textwall or Twitter). Students could make notes on the screen side by side with the slides (it looked like videonot.es but was practically the same as downloading a PowerPoint and annotating it). There were a few nice additional features like the ability to put a pin on an image slide, a ‘star’ icon to mark a particular point as important and a ‘flag’ to signal confusion (enough raised flags would elicit the lecturer’s attention). The whole thing would then be available for students to save and review later. The fact that so much of this is familiar, albeit in fragments, made me realise just how ‘online’ even our most traditional form of teaching, the lecture, is becoming and how blurred the boundaries are. This blog post is partly a contribution to the How to Teach Online MOOC and reflecting on this morning’s session has given me a new perspective on what it might mean to ‘teach online’ at this point in the development of UK university teaching. I’m unexpectedly away at the ALT-C conference for a few days and also have 2 job interviews this week so it’s a rather intense time and not surprisingly my MOOC reading has suffered a bit. With only my mobile devices to hand I haven’t been able to catch up with the webinars either. I’m now sounding like your worst student aren’t I? 1. Decide how you want to teach online. 2. Decide what kind of online course you and your students need. 3. Work in a team. 4. Build on existing resources. 6. Set appropriate learning goals for online learning. 2. Work with the academic (tutor / convenor) to discuss and choose relevant available technological options bearing in mind disciplinary context, staff experience, enthusiasm etc. And plan its use. 3. Provide scaffolded support and training for staff and students leading them to learn by doing. 5. Share / disseminate interesting outcomes and related resources to encourage others to consider trying the approach. ‘Identify the learning need’ becomes ‘decide what kind of online course you and your students need’. ‘Work with the academic’ becomes ‘work in a team’. ‘Build on existing resources’ is somewhat analogous to bringing in the disciplinary context and factoring in staff experience and enthusiasm. This is where we diverge a little, but back at the identifying the learning need and choosing relevant TEL tools stage there would have been an explicit goal for the innovation – to resolve the learning issue. And the use of the technology would have been carefully planned as part of the discussions between learning technologist/advisor and academic. The last two steps I would do the other way around, evaluating first then communicating. So before I’ve even read the material I’ll feeling quite comfortable with the approach and as soon as I get the chance I’ll be launching into the materials wholeheartedly. In the meantime I look forward to reading what others have made of it all. With not much time to catch up before next week’s email arrives in my inbox what do you suggest I look at first? Feedback dialogue: can campus courses learn from online? Rola Ajjawi from the University of Dundee presented a session at the ALT Conference this morning on ‘Building new cultures of learning: using technology to promote assessment and feedback dialogue‘ and there were several points from it that I wanted to reflect on and blog about for my own learning in relation to feedback and technology but also in relation to the How to Teach Online MOOC I am currently engaged in. I’m not going to summarise the session, but you can read more about the innovations that Rola and her colleagues introduced by following the link to the materials on the conference website above. Instead, I will focus on what for me were the things that rang bells and made connections in my mind. The Dundee example was in the context of an online non-cohort course, but I believe that the basic principles underpinning the innovations could be applied equally effectively in traditional face-to-face or blended courses. 1. restructuring the assessment regime to include more opportunities for low stakes formative feedback. 2. adding a reflective stage to turn what Rola referred to as ‘monologic feedback’ into a dialogue between student and tutor. Each of these innovations could be expected to make a contribution to improving the effectiveness of feedback and students’ satisfaction with it. The first, by increasing the number of feedback points where students could get advice and guidance from tutors before their ‘make or break’ assessment. The second by initially pushing students to think about and articulate how they will use the feedback they receive and gradually developing their ability to self-evaluate. I found myself wondering whether this sort of thing is easier to do in an online course. I don’t mean the technology because the way it was handled (uploading documents for marking, then using a tutor-student one-to-one wiki template for the student to respond to the feedback) could be done in a VLE associated with a face-to-face class or even by email or on paper. What I mean is that in good online courses there is an expectation that tutors will need to put in place activities like this to provide support, build learning environments and develop relationships with students whereas it is too often assumed that these things just happen automatically if tutors and students share physical space. It doesn’t. What do you think? Do campus-based courses have some things to learn from virtual ones? Decide how you want to teach: free up class time for the things you can best/only do F2F. Decide what kind of online course you and your students need: at present, my teaching is hybrid/blended; Content – think about how you input this e.g. lectures, notes, videos? Skills – application of content; F2F – why do students have to be here? Questions to ask yourself: What’s unique about a campus experience? Am I making best use of this/their time? Work in a team: share materials, resources, expertise; advise novices; Instructional design (= designing a course) – if done well, should reduce tutor’s workload. Build on existing resources: Ask yourself: How original is my content? Can I use pre-made sources? 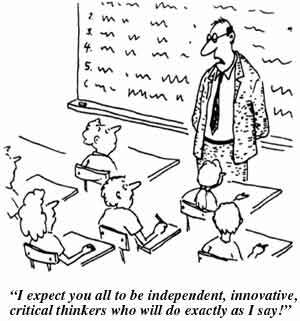 Choose/use quality content already out there (iTunesU, Open University, Khan Academy etc) and don’t reinvent the wheel! Share with colleagues – see above. Master the technology: Learn what features your LMS offers & how to best use tools to enhance learning. Videos of lectures NOT online teaching! But if you do make videos, max. 15mins and only of unique content not already out there, e.g. your own research, an interview with an expert. Set appropriate learning goals for online learning: Should be particularly suited to OL e.g. 21st century learning skills i.e. managing knowledge; Good communication skills – writing/speaking: yes, but students also need to learn to do this on social networks, via YouTube, blogs, wikis; Independent (SDL) and inter independent learning skills (with others/teams); Domain specific IT skills i.e. what students will later need for their jobs (Excel etc). Think about how you will assess these skills and tell your students too! Design course structure and learning activities: Teaching structure: determined by institution; teaching philosophy; needs of students – strong: students know what/when to learn i.e. what to do (my current situation); weak – less controlled by teacher. Ideas/tasks: SDL – assign/find a student “buddy”; after reading activities: 3 insights gained or questions you now have. Communicate, communicate, communicate: Be present as a tutor; tell students what expected of them e.g. how many posts to read etc; when commenting, try to add something new and not just agree/disagree. Evaluate and innovate: nothing I didn’t already know! I’m in the process of updating/revising a blended learning Professional English course, so will definitely bear the above in mind.